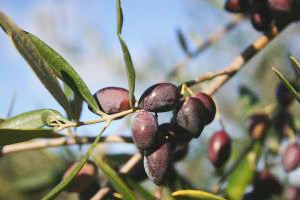 Olive oil is pressed from the fresh-picked fruit of the olive tree. Photo by Iliana | SXC. This is Page 5 of the Olive Oil & Olives Glossary. If you think we should consider terms or definitions than those we have provided, use the Contact Us links on this page. Also read our article, Flavors and Aromas of Olive Oil. Visit our collection of 60+ food glossaries to learn more about other food products. without having to scroll manually. Harvesting of the fruit is done in the autumn. Harvesting usually continues for about two months, or until the fruit becomes damaged by frost. The table olive harvest is done by hand-picking so as not to bruise the fruit; ladders are used to climb into the tree. The FDA allows olive oil manufacturers to place a health claim on bottles linking olive oil to reduced risk of coronary heart disease. Olive oil controls LDL (“bad”) cholesterol levels while raising HDL (“good” cholesterol) levels. Continuing research indicates there may be other benefits as well, from the redistribution of body fat to painkilling properties, but these have not yet received FDA sanction. 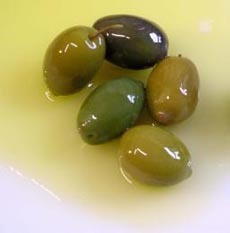 One of the major olive varieties of southern Spain, grown in the provinces of Córdoba, Granada, Malaga and Sevilla. Hojiblanca produces a yellow oil with a green and violet tinge. Its flavors vary between intense and fruity, and smooth and sweet. The oil is known for nuances of apple and green grass, which can give it a hint of bitterness, and almond finish. It is enjoyed for its smooth taste and lightness on the palate. Its stability is considered average. (1) It is not safe to prepare homemade infused olive oils unless they will be used immediately. The inclusions (herbs, chiles, peppercorns, etc.) may promote bacterial growth that can cause illness. Commercial processes eliminate harmful bacterial growth. (2) IOOC Definition: Technically, olive oil which has had herbs or fruits infused in it cannot be called olive oil. According to IOOC regulations it must be called “fruit juice.” In reality, few producers comply with this, labeling their products “lemon infused olive oil” or “basil olive oil.” Because of their immense popularity, the California Olive Oil Council is trying to come up with a meaningful labeling standard for flavored and infused oils. Basil-infused olive oil from Fig & Olive Connection. The International Olive Oil Council (IOOC) determines standards for grades of olive oil for most of the world. 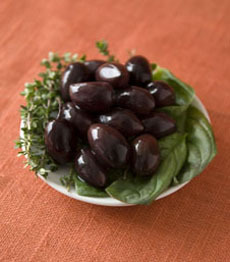 A large, meaty black or deep purple olive, up to one inch in length, with a rich, fruity flavor. The almond-shaped Kalamata is largely used as a table olive, not generally pressed into oil. It is popularly served with lamb, swordfish and pasta dishes and is a component of a Greek salad. As a cocktail olive, it pairs well with Merlot. It is named after the city of Kalamata, Greece, in the southern Peloponnesian mountains. Photo of Kalamata olives by Corey Lugg | THE NIBBLE. These are from Sonoma Farm. A small olive from the area around Kalamata, Greece, which represents close to 60% of the total Greek olive-growing area. Although difficult to cultivate, it has a high yield and produces olive oil of exceptional quality. The oil is very fruity, with an aroma of leaves and grass and a flavor with notes of green apple. It has some astringency, with hints of almond, fig and bark. Though very flavorful, it has low stability, i.e., has a short shelf life once the bottle is opened, so use it up quickly. Photo of koroneiki olive by Aristides Papadakis | SXC.